It was supposed to be Walter Carr’s first day of work with a moving company Sunday when his car broke down. But, instead of calling out, he walked through the night to be on time. Carr’s vehicle stopped working the night before his first day with the moving company Bellhops, and he knew he couldn’t miss it. So, he decided to walk. Carr began his hike from Homewood, Alabama, to the town of Pelham, Alabama, at midnight. He walked at least 14 miles before police picked him up at 4 a.m., reports CBS affiliate WIAT-TV. Once police heard his story, they took Carr to breakfast. Then, they gave him a ride the rest of the way to the home of the Lamey family, who he was scheduled to help move that morning. Carr arrived at the home of Jenny Hayden Lamey and her family before the rest of the movers arrived. “I asked Walter if he wanted to go upstairs and rest until everyone else arrived,” said Lamey in a Facebook post, “He declined and said he could go ahead and get started.” So, the family and Carr began packing up the home, chatting along the way. Lamey discovered that Carr and his mother were from New Orleans, but moved to Alabama after losing their home during Hurricane Katrina.”He looked at me in the eye and smiled and I felt like I had known him much longer,” wrote Lamey of the pair’s interaction that morning. Lamey shared the story of Walter and her move on Facebook — the post quickly went viral. And word eventually got back to the CEO of the Bellhops moving company, Luke Marklin. “I’m really proud to be on the same team as Walter,” Marklin wrote on Twitter,“We set a high bar on service and he just raised it. 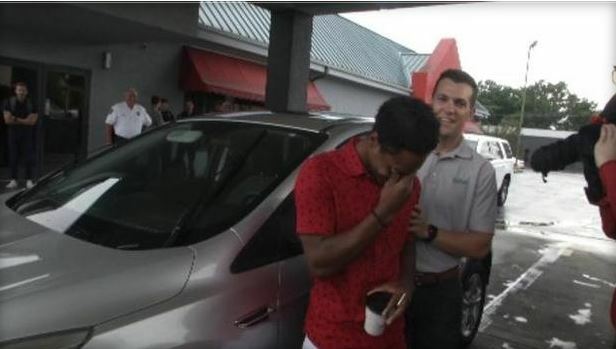 Look forward to thanking him in person this week.” But, Marklin did a bit more than just thank Carr — he gifted Carr his 2014 Ford Escape, according to WIAT-TV. While the young man’s long walks to work may be over, few will forget the perseverance he showed along the way.